Learn how to make an oven mitt with this free pattern and tutorial. In just an hour or so you'll have a handmade oven mitt that you can give as a gift or keep for yourself. This is a great project for a confident beginner, using basic sewing and quilting techniques. You'll learn a lot during the process and walk away with an oven mitt that fits your style. This project is perfect for using up some large pieces of scraps and is fat-quarter friendly. Looking for more ways to add some homemade touches to your kitchen? Here are some free pot holder patterns to get you started. 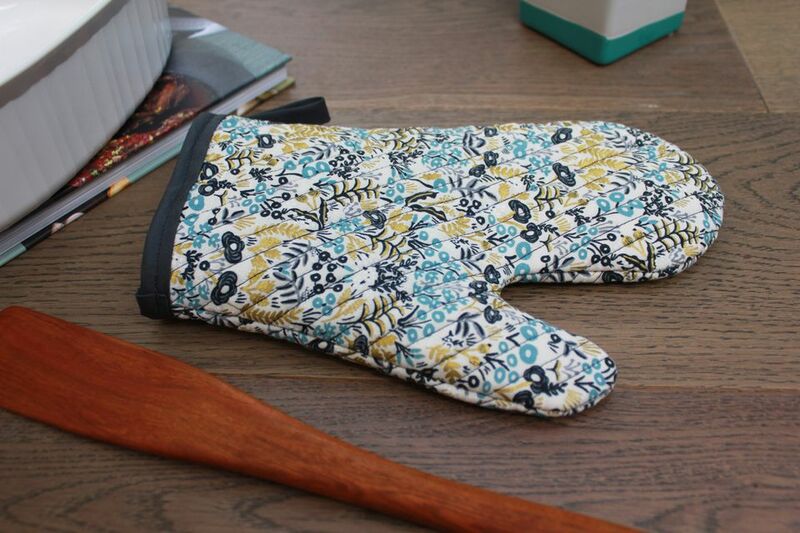 Here's what you'll need to to make your quilted oven mitt. We recommend using cotton fabric, canvas, or home decor fabric for the exterior of the oven mitt. For the lining, you should use cotton fabric. You can purchase pre-made bias tape or you can make your own. Adding some simple quilting to your oven mitt will help hold everything together and also add some nice detail to the finished mitt. It's easiest to do the quilting before you cut out the oven mitt shape. Baste all your layers together using safety pins or basting spray. Make sure that everything is smooth and you don't have any wrinkles. Make a second quilt sandwich for the other side of the oven mitt. Take your quilt sandwich over to your sewing machine and machine quilt as desired. You'll get the best result if you start your quilting in the middle and work your way out. Make sure that everything stays smooth while you're quilting. Remember to take those pins out as you come across them! Repeat for the other quilt sandwich. Take your two quilted pieces and place them right sides together. Place the oven mitt template on top of your quilt sandwich and trace around it. Secure the two pieces with pins. If you don't have your walking foot attached to your machine yet, you'll want to do that now. These are thick layers and your sewing machine needs that extra traction to sew over them. Sew along the marked oven mitt template line only along the sides. Do not sew along the bottom of the template. Be sure to backstitch at the beginning and the end so everything stays securely together. You'll want to sew slow along the curves, pivoting as much as you need to. Remove the pins and cut out around your sewn oven mitt, giving yourself a 1/4-inch seam allowance, being careful not to cut through your stitching. Use your scissors to make a few snips along the curves of the mitt, especially down by the thumb. Again, be careful not to clip through your stitching. Turn your oven mitt inside out, using a pencil or fabric turner to get it completely turned. Give it a good press with your iron. If you'd like your oven mitt to hang, you can make a simple loop out of bias tape to form one. This is a completely optional step, feel free to skip it if you like. Cut off a 5" piece of bias tape and fold it in half. Pin or clip right sides together at one of the oven mitt seams, raw edges lined up. Sew to attach. Cut off a 16" long strip of bias tape. Open up the long raw edge of the binding and place it so it encloses the raw edge of the oven mitt, starting at the seam without the loop. Use pins or clips to secure the rest of the binding around the bottom of the oven mitt. When you get the loop, be sure to enclose it along with the bottom of your oven mitt in the binding. When you're done pinning, you'll have some extra binding, just leave that on for now. Stitch 1/4-inch away from the top of the bias tape, all the way around until you get almost to the end, backstitching at the beginning. Be sure to sew around the bottom of the oven mitt, don't sew the bottom off the mitt together. This will be a little tricky, so just go slow and take your time. Stop sewing about 2-inches before you come back to where you started attaching the binding. Cut the extra bias tape off, leaving 1-inch extra to overlap where you started. Open up the short end of the bias tape you just trimmed and fold the raw edge into the binding and then fold the binding back up. This will give you a nice finished edge. Clip or pin if needed. Finish sewing on the binding, making sure that the finished short end covers up the raw edge of the binding where you started. Backstitch to secure.